I don't want to start another post talking about the weather,but I do think its a good way to start by letting you all know what's happening in our part of the world. So on that note, the weather has been pretty finicky here...sometimes cold and sometimes very pleasant like today. There, I did it again!! :D The weather..oh weather! Now back to the food. Every time we go to an Italian restaurant, I wish I could have the Lasagna -- probably the one dish I haven't tried in a restaurant since it contains meat. And having been to a lot of Italian restaurants, I know there is no Veggie Lasagna out there. That kinda motivates me to make Lasagna at home with my own "loaded with veggies" sauce. The first time I made Veggie Lasagna was for the DB challenge several months ago. That was with made from scratch pasta, but this time I just took the easy way out and used store bought dry pasta. The sauce is chunkier with more veggies and white beans. 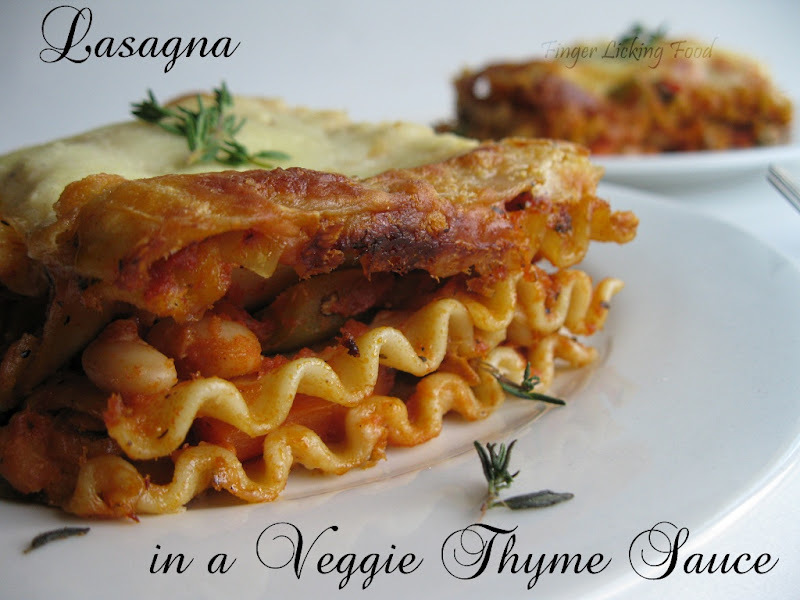 Fresh Thyme makes the Lasagna taste and smell wonderful. Bring a pot of water to boil the lasagna sheets in. Salt the water and drop in the sheets. Stir and let cook for 8 minutes. Drain and reserve. While the pasta cooks, prepare the vegetable sauce. Heat olive oil in a pan. Add the garlic and chopped onion. Saute till onions are soft. Add the bell peppers, mushrooms, carrots and peas. Cook on low heat till all the veggies are done. Add the chilli flakes, fresh thyme and cook till the thyme is fragrant, about a minute. Stir in the marinara sauce and the drained white beans. Add ½ cup of water and bring the sauce to a boil on medium heat. Season with salt. Turn off heat. A few months ago one of the Daring Baker challenges was Spinach Pasta made from scratch and used in a Lasagna. I chose to make the same Bechamel sauce because it tasted great. 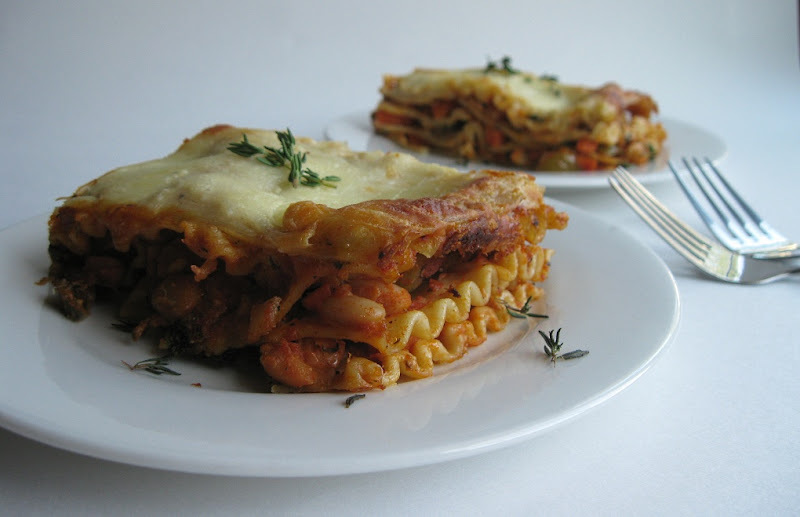 The sauce adds a whole lot of flavour and makes the entire lasagna irresistible…really! Take an 8x8 inch glass pan. Preheat oven to 400F. Place a layer of lasagna sheets, about 3, side by side. Spread about two tablespoons of the Bechamel sauce on top. Sprinkle with about a teaspoon of grated Parmesan. Spread about ¼ cup of vegetable sauce. Repeat the layers – lasagna sheets, Béchamel sauce, Parmesan and Vegetable sauce. 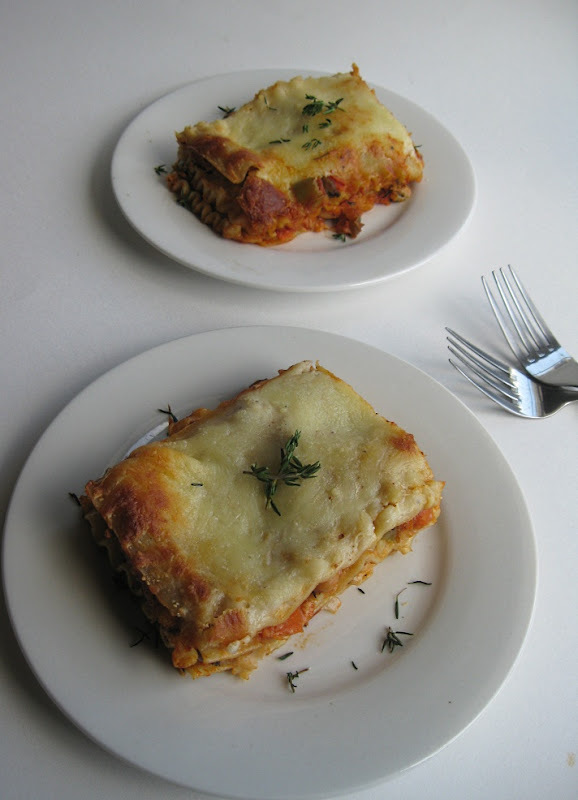 The top most layer should be lasagna sheets.Sprinkle with remaining Parmesan and top off with shredded mozzarella. Bake for 15-20 minutes until the cheese is bubbly .Let sit for a few minutes before serving. yummy lasagna .looks delicious in the picture. wow I love to grab that plate with a piece of Lasagna...looks yummy dear.. Very Flavorful and delicious lasagna Namratha! The lasagna looks like its from an Italian restaurant :) Looks superyummy! check out this link.If u gave u gave her permission to use ur photo......'m sorry. I love pasta and lasagna. this one is yumyy coz i also dont eat meat. this one is bookmarked will let you once made. looks absolutely delicious! I'll try your recipe out.